The American Concrete Pavement Association Board of Directors is the governing body of the Association. It directs, supervises and controls the activities of the Association, its committees, published information and other means of communication. It may delegate duties and responsibilities to various staff, officers, agents and/or committees, but always retaining the privilege and responsibility of final review and approval. Although final responsibility for the Association ultimately rests with the general membership, the Board of Directors is the Association’s effective governing body. A leadership role in the Association requires sacrifices of time and effort, and in that spirit, directors should be members of firms actively engaged in the concrete paving industry, as an individual possess the same qualifications of skill and integrity that all Association members should demonstrate, devote the time, capability and willingness to attend National Board meetings, become involved with any local chapters or affiliates that they may belong to, and communicate and promote national programs and policies at the local chapter or affiliate level. ACPA Board members are volunteers from member companies and affiliated organizations, including the ACPA-affiliated Chapter/States and the International Grooving & Grinding Association. The ACPA Board of Directors is composed of individuals representing the membership from the various membership classes. There is no requirement for the number of directors from any specific class of members. The Board of Directors consists of a minimum of 17 and maximum of 22 voting directors. The Chapter/Committee holds two ex-officio director positions on the Board of Directors. Any executive or employee appointed by a member in good standing to represent its interests in the Association is eligible for election to the Board of Directors. Lori Tiefenthaler, 2017 Chairperson, Senior Director of Marketing, Lehigh Hanson, Inc., Irving, Texas. Chuck Niederriter, 1st Vice Chair, Chief Operating Officer, Golden Triangle Construction Co., Inc., Imperial, Pa.
James Mack, P.E., 2nd Vice Chair, Director, Market Development, CEMEX, Houston, Texas. Greg McCormick, 3rd Vice Chair, Estimator/Project Manager, Northern Improvement Co., Fargo, N.D.
Steve Jackson, Immediate Past Chair, President/CEO, Cedar Valley Corp., LLC, Waterloo, Iowa. Shane Whitacre, P.E., Treasurer, Regional Vice President, Dayton Superior Corp., Miamisburg, Ohio. Steve Ambrose, Vice President-Sales, Marketing and Logistics, GCC America, Denver, Colo.
Mark Brown, P.E., Corporate Quality Control Manager, Zachry Construction Corp., San Antonio, Texas. Lawrence Bush, Treasurer, McCarthy Improvement Company, Davenport, Iowa. Mike Gordon, Vice President-Sales & Marketing, Continental Cement Company, LLC, Chesterfield, Mo. Ed Griffith, Vice President of Sales & Marketing, St. Marys Cement Company, Detroit, Mich.
George Hassfurter, Vice President/Director of Business Development, The Lane Construction Corp., Charlotte, N.C.
Martin Holt, Corporate Quality Control Manager, Interstate Highway Construction, Inc. (IHC), Englewood, Colo.
John “Jake” Jacob, CEO/President, Rexcon LLC, Inc., Burlington, Wis.
Mike Lipps, Vice President-Operations, Duit Construction Co., Inc., Edmond, Okla.
Dan Rozycki, President, The Transtec Group, Inc., Austin, Texas. Rick Sniegowski, Vice President/COO, K-Five Construction Corp., Westmont, Ill.
Maik Strecker, Vice President, LafargeHolcim, Chicago, Ill.
Greg Dean, 2017 Chapter Committee Chair, Executive Director, Carolinas Concrete Paving Association, Raleigh, N.C.
Jim Powell, P.E., 2017 Chapter Committee Vice-Chair, Executive Director, Northwest Chapter – ACPA, Olympia, Wash.
John Roberts, IGGA Liaison, Executive Director, International Grooving & Grinding Association/ACPA Pavement Preservation Partnership, Coxsackie, N.Y.
First Meeting of the ACPA Board of Directors. 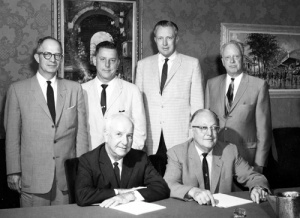 Interim Officers of ACPA, Dec. 1964. 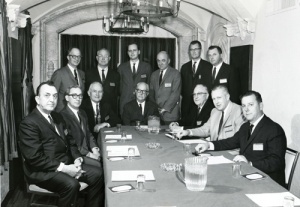 ACPA's first Board of Directors convened its first formal meeting on December 14, 1964 at the Sheraton Hotel in Chicago, Ill. ACPA’s first elected Board of Directors are shown in December 1964 photo on the left. Seated (counterclockwise from left) are: George R. Bathe; J.J. Marcello; A.V. Williams; Sam M. Porter; Harold W. Hartmann; W.E. Swanson; and Charles P. Ballenger. Standing (L-R) are James D. Piper; George D. Williams; Christopher (Kip) Koss; W.L. Harper; L.E. Denton; and Hamilton Strayer. Not present for the photo were R.W. Dial; William H. Tate; and George C. Koss. This page was last edited on 17 February 2017, at 12:19.